This week, a song that is both bitter and sweet. 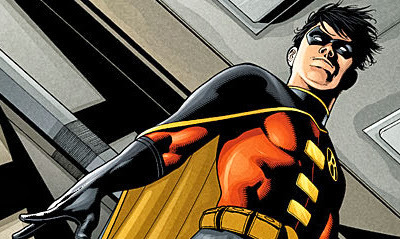 Rancid get three thumbs up for cutting a track 'sung' from the perspective of third Robin, Tim Drake. Perhaps even half a thumb more for the line below pointing out he's lesser known. Only they stumble at the hurdle by using Wolverine as Tim's partner and not Batman. Now I know no continuity rules apply in songs, but hey, there's always room for Batman right? Or at least Grayson. Fighting crime in the streets together!" Now how is it they know who the the third Robin is, but they don't get it right that Batman is his partner, not Wolverine? Things that make you go hmmmm...and WTF? Hey Anon - yup, sure do - was a pretty big grunge-rock fan a few years back. While Tim Armstrong could be singing his own name, I still put my money on the dial that writing a song about a sidekick super-hero, he'd have written about the biggest in the business, Robin, and that the Tim/Tim is a happy coincidence that sealed the deal. Then Freeman can also sing it too if Tim needs a breather. Cheers for commenting! 'Things that make you go hmm' - Have you had a 90's weekend Dale? It's one of the hardest things to explain in comics I reckon, the whole Robin line. Hopefully if Nightwing lands in the upcoming Superman/Batman movie as he's rumoured too, that could save a lot of talkin! I'm just glad no one's ever pitched the Batman/Wolverine crossover movie. Man, I shouldn't have said that out loud. Hugh Jackman fighting Ben Affleck. You couldn't even sell tickets to get people to see that one! Theyd be bashing the theatre doors down! We really should get paid for these ideas.